I have two teenage children. Their names are Rangga and Audi. Rangga is my oldest son. My first-born. Audi, was born 18 months later after her brother. She is my only daughter. About 10,5 years later, my youngest son, Farrell, was born. I’ve shared a little story about my youngest. Now, let me tell you story about my two teens. Well, that’s my little man. Rangga was always smart and understands his mother’s words. He’s my son afterall, so we do speak the same “language”, as he has half of my chromosomes in his DNA. So does Audi. Well, 15 years later, I am looking at my babies-turned-teens now. I can’t help but feeling proud. I know I may not the best mother in the world, but I’m trying to be the best mother I can be for my children. I try to provide everything my children needed, even though I’m not rich. Instead, I try to be their friends they can turn to and talk to. Alhamdulillah, my children seemed to feel free to talk about anything with me: about school, about anime (because they’re as “otaku” as I am), about relationship, about boys and girls they liked, etc. Anyways, I can’t help but seeing them as my babies. As brother and sister of almost the same age, of course they fight a lot. My daughter turned to become a tough girl–a little tomboy, like I was–and my son is a patient & smiley boy, like his dad. Sometimes their fights were not only verbally, but also physically. Okay, I allowed them to practice Karate but not for such reason whatsoever, come on you guys! Anyways, despite their teen of ages, I still looked at them as babies. When the two get along in front of the ‘puter or the telly, I remember this scene I recorded in my mind 13,5 years back. Almost every morning Rangga and Audi chasing each other. Sometimes they played hide-and-seek. And talking to each other with their baby-language. One day, before I went to the campus, Audi was chasing Rangga. Audi was still crawling at that time and Rangga was running on his little feet. The two of them were laughing and running around our little green house in Jl. Intan, Sadang Serang, Bandung. They then stop near the staircase to second story. The morning sun was shining down, reflecting itself on the floor via the void of the stair. Rangga touched the floor and smile. He “spoke” to his sister, perhaps telling her this, “Hey, the floor is warm!” ^_^ Audi was looking at him briefly, and moved herself to the bright floor, and seemed to agree with her brother. The next thing I saw was, the two siblings were sitting down calmly on the warm floor, letting the sun shine bathed their skin. They were giggling and “speaking” to each other and chuckled. Enjoying the sun like two kittens. It was the most memorable and favorite scene of my children, in my entire life. The scene stays in my head and it keeps coming back to this day. I love you, kiddos. 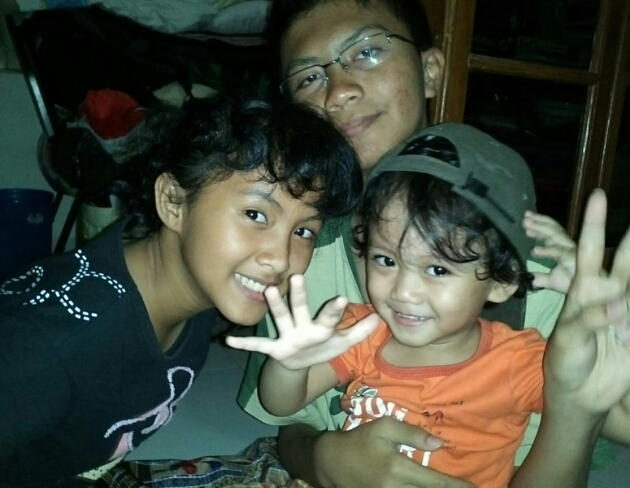 I’m proud of you three–Rangga, Audi and Farrell–every single day.